Veterans and other citizens salute Army Specialist Ronnie McCulley in Tulsa. The following story by Emily Baucum, first appeared March 26th, News On 6. 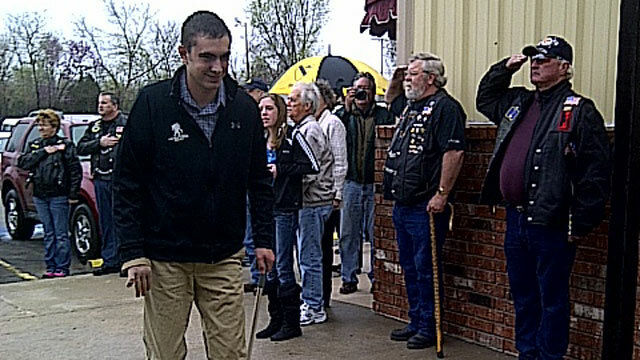 TULSA, Oklahoma — A wounded veteran was recognized for his service Saturday at the American Legion hall on East Admiral. Ronnie McCulley was on his way home from San Antonio where he travels for treatment for burn injuries. Veterans saluted the young Owasso soldier who was badly burned in an explosion in while serving in Afghanistan. “It’s something I always wanted to do, especially after 9/11. It’s something I had a passion for,” he said. The 21-year-old Army Specialist spent six months patrolling the rugged mountains of Afghanistan until he was injured in October 2010. “I was actually in the guard towers about 3 o’clock in the morning. I saw a few guys that were walking in the riverbed in front of me,” McCulley recalled. Before McCulley could call for help, he was hit with an incendiary device. His entire body caught on fire. “I got burned basically from my collar line all the way down to my toes,” Ronnie McCulley said. “They flew me to Germany the next day. We got to see him. Of course, he doesn’t remember any of that,” said Ronnie’s dad Ron McCulley. Countless surgeries later, Specialist McCulley is home. A cane and compression bandages are the only signs of his battle wounds. Veterans wanted to thank the 21-year-old for his service to his country. But it was McCulley who said thanks to every veteran in the room. “He’s always thanking people and really, we need to be thanking him,” McCulley’s father said. Specialist McCulley received a plaque honoring his service and positive outlook on the accident that changed his life. “You see people who have it way worse. 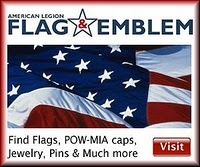 It was an honor and a blessing to serve my country,” the 21-year-old said. Specialist McCulley expects to undergo even more surgeries, including one to amputate his pinky. It’s unlikely he’ll return to any war zone. Follow McCulley’s progress on Facebook.